Health and social welfare technology provides potential alternative tools in facing the upcoming demographic challenge of an increased amount of older adults and, consequently, the increase in the number of individuals with dementia. Worldwide, 35.6 million individuals have been diagnosed with dementia and every year 7.7 million new cases are diagnosed (World Health Organization [WHO], 2012). The predicted proportion of the general population 60 and older with dementia is between 2 and 8 per 100 individuals (WHO, 2012). The total number of individuals with dementia is projected to almost double every 20 years, to approximately 66 million by 2030 and 115 million by 2050 (WHO, 2012). Much of this increase is related to change in demographics, with growing numbers of individuals with dementia living in low- and middle-income countries (WHO, 2012). It has been suggested that dementia and Alzheimer’s disease will be the most significant conditions to impact the aging society and its caregivers (Roger, Guse, Mordoch, & Osterreicher, 2012). Dementia is associated with challenging behaviors, such as agitation, wandering, and aggression (described as behavioral and psychological symptoms of dementia [BPSD]), which are abnormal verbal, vocal, or motor activities caused by confusion (Cohen-Mansfield, 1986). In addition to a decline in physical functioning, psychological symptoms related to dementia, such as altered communication and depression, can cause individuals with dementia to feel socially isolated and lonely. Introverted individuals with dementia are at high risk of further cognitive and functional decline and poor quality of life (Yeager & Hyer, 2008). Dementia is overwhelming, not only for individuals living with the disease but also for their relatives and professional caregivers. Innovative strategies, which aim to enhance or maintain quality of life for individuals with dementia, may also strengthen relationships with their caregivers. Currently, no treatment exists to cure dementia. Therefore, alternative forms of care are emphasized as the focus in research, aiming to improve the well-being of individuals affected in various ways by the disease (e.g., individuals with dementia, family members/relatives, professional caregivers) (Swedish Agency for Health Technology Assessment and Assessment of Social Services [SBU], 2006). The principal goals of dementia care are the optimization of physical health, cognition, activity, and well-being, as well as the detection and treatment of BPSD (SBU, 2006; WHO, 2012). Many individuals need innovative solutions in dementia care (Cesta et al., 2011; Huschilt & Clune, 2012; SBU, 2006; Shibata, Wada, Ikeda, & Sabanovic, 2009). Alternative forms of care, such as art, music, dance, singing, massage, and pets, are advocated. Research has shown that art and music (Gerdner & Swanson, 1993; Sung, Chang, & Lee, 2010) facilitate health and stimulate feelings of individuals with dementia. Spending time with a pet is seen as valuable (Friedmann, Katcher, & Thomas, 1980; Libin & Cohen-Mansfield, 2004; Sellers, 2006) and the reason for this positive effect on humans has been discussed. Two major theories have been proposed. The first theory is the biophilia hypothesis (Wilson, 1984), which relates to humans being naturally drawn to animals and other living species, and is explained in evolutionary terms as entailing a greater possibility of surviving danger. The second theory is the social support hypothesis (Beck & Katcher, 2003), which proposes that animals give their owners social support and mediate between owners and others. However, there can be obstacles to using pets in care (i.e., animal-assisted interventions). For individuals with dementia, obstacles may include the risk of infection, allergies, injury, and fear or discomfort regarding animals (Duncan, 2000; Morrison, 2007). Conflict may also arise among individuals with dementia who claim the pet as their own (Moyle et al., 2013). For professional caregivers and relatives, a pet involves additional duties (e.g., feeding, walking, cleaning). Finally, for the pet, increased stress may be caused by (a) being handled by numerous/unknown individuals (Fallini, Prato Previde, & Valsecchi, 2007), (b) new environments, or (c) being exposed to unfamiliar noises (Beerda, Schilder, van Hoff, de Vries, & Mol, 1998). Based on these issues and the results of various studies, the use of robotic pets has been suggested. In a review of animal-assisted interventions, which included robotic pets for patients with dementia, promising results were found (Bernabei et al., 2013). Studies of social-commitment robots (Mordoch, Osterreicher, Guse, Roger, & Thompson, 2013; Moyle et al., 2013; Roger et al., 2012), social-assistive robots (Huschilt & Clune, 2012), and interactive robotic pets (Gelderblom, Bemelmans, Spierts, Jonker, & de Witte 2010; Heerink et al., 2013; Wada, Shibata, Musha, & Kimura, 2008; Wada, Shibata, Saito, Sakamoto, & Tanie, 2005) have indicated enhanced communication (Roger et al., 2012), reduced effects of BPSD (Marti, Bacigalupo, Giusti, Mennecozzi, & Shibata, 1996; Wilson, 1984), less loneliness, better role functioning, improved satisfaction, and lower levels of stress (i.e., salivary cromogranine A) (Kanamori, Suzuki, & Tanaka, 2002). A promising example is the interactive robotic seal, PARO (Mordoch et al., 2013; Moyle et al., 2013; Wada, Shibata, Saito, & Tanie, 2004), which was developed in Japan and has demonstrated positive results concerning mood state (Marti et al., 1996; Wada et al., 2004). A continued need to develop protocols for the enhanced use of such robots has been emphasized (Roger et al., 2012) and further studies are being conducted to develop robot pet technology (Bernabei et al., 2013). Health and social welfare technology innovations aimed at supporting and offering alternative care and treatment for improvements in health or social care should be scrutinized to prove their impact. This approach is even more relevant when new care and treatments are developed for vulnerable populations, such as individuals with dementia. The aims of the current pilot study were to explore the reactions of individuals with dementia to an interactive robotic cat and their relatives’ and professional caregivers’ experiences regarding its usability, function, and effects. The pilot study had an intervention, mixed-methods design (Creswell, 2010) and was conducted in two stages. A quantitative single-case study (Kazdin, 1982), including individuals with dementia, and a qualitative interview study (Sandelowski, 2000), including relatives and professional caregivers, were conducted. Using a mixed-methods design was an attempt to give a more comprehensive view of the use, function, possible impact, and experiences of using an interactive robotic cat. The intervention (i.e., use of the robotic cat) took place during Weeks 4–10 of the study (Figure 1). Flow chart illustrating the stages, weeks, and data collections. JustoCat® (Figure 2) is an interactive robotic pet developed using reminiscence therapy as a framework (Woods, Spector, Jones, Orrell, & Davies, 2005); it is the result of considering the promising outcomes of the robotic seal, PARO (Mordoch et al., 2013; Moyle et al., 2013; Wada et al., 2004). However, the inventors of JustoCat assumed that a seal would not appeal in reminiscence therapy (Woods et al., 2005), as few individuals in Sweden have memories related to seals. In Sweden, cats are a common domestic pet (Central Bureau of Statistics, 2006); therefore, a robotic cat was assumed to appeal to individuals’ memories of cats. There was also the idea of downscaled, advanced technology based on the hypothesis of a robotic cat’s functional reliability and lower cost. The construction of JustoCat (e.g., easy-to-change fur facilitating personalized use, washable fur) was developed following Swedish hygiene routines required in nursing homes and hospital settings (Vårdhandboken, 2013). JustoCat® (Robyn Robotics AB, Västerås, Sweden). A dementia care home situated in a medium-sized municipality in the middle of Sweden, caring for individuals with severe dementia not able to live in their own homes, was chosen for the current study. Staff were available around the clock and comprised mostly assistant nurses providing bedside care, but also RNs, an occupational therapist, a consultative physiotherapist, and physicians. Two of six units for individuals with dementia, their relatives, and professional caregivers participated in the current study. All professional caregivers involved in the care of the informant individuals with dementia were invited to participate. A purposive sample of individuals with dementia in a late stage of the disease, and who had shown signs of BPSD, were recruited. Participants known to have an aversion to cats were not eligible to participate. A specially trained occupational therapist made the selection based on the above criteria. The single-case stage included four individuals with dementia (two men and two women) ages 82 to 90. The individuals with dementia had been living at the dementia care home for 23 to 47 months, respectively. However, one participant demonstrated a previously unknown aversion to cats and was therefore excluded. The participant was replaced with another individual with dementia. Informed consent for all individuals with dementia was collected from their relatives. Three relatives of the participants were willing to participate in the interview stage. Their relationship to the participants was either wife or son. Among the professional caregivers, 11 of the 16 eligible providers agreed to participate in the interview stage and included two RNs, one occupational therapist, and eight assistant nurses. The professional caregivers had 1.5 to 15 years of experience in dementia care. Five professional caregivers declined to participate because of parental leave, terminated employment, or difficulty finding time for interviews. According to the single-case A-B-A design (Kazdin, 1982), a 3-week baseline (i.e., phase A) with nine Quality of Life in Late-Stage Dementia scale (QUALID; Weiner et al., 2000) and Cohen–Mansfield Agitation Inventory instrument (CMAI; Cohen-Mansfield, 1986) measurements initiated the data collection. In Phase B, the intervention was performed for 7 weeks (Weeks 4–10). The first week included introducing JustoCat to participants and showing them how to use it. The professional caregivers were instructed and supervised by the specially trained occupational therapist to be sensitive to the participants and not force the introduction and training. The intervention involved activities of discovery, engagement, and emotional response, as well as social interaction between the participants and professional caregivers through touching, holding, and petting the robotic cat. Supervised by the occupational therapist, the professional caregivers presented JustoCat and demonstrated how to stroke it and make it purr. The importance of staying with the participant was emphasized (i.e., to not just hand over JustoCat and leave). Professional caregivers were also given suggestions on how to work with JustoCat, support interaction with it, and communicate with participants. It was suggested that the professional caregivers should consistently talk about JustoCat and ask what the participants experienced (e.g., “Is it smooth?”, “Is it breathing?”, “Is it purring?”, “Why is it purring?”, “What is it called?”, “What is the name of the cat?”, “Have you met cats before?”, “Have you owned cats?”, “Have you known other cats?”, “What was/were its name/their names?”). After individually adapted introductions, participants had free access to JustoCat, although some needed to be reminded. The first stage of the study focused on challenging behaviors and quality of life among the participants. Occurrence of abnormal vocal or motor activities caused by BPSD was measured using the CMAI. The CMAI, administered by the professional caregivers, contains 29 items on a 7-answer option scale concerning aggressive physical, non-physical, and verbal behavior. Summary of scores ranges between 29 and 103, in which higher scores indicate higher frequencies of agitation. Good internal consistency (Cronbach’s alpha = 0.86) has been reported (Finkel, Lyons, & Anderson, 1992) and interrater agreement rates between 0.88 and 0.92 have been reported (Cohen-Mansfield, 1991). Interrater reliability has been calculated for each subtype of agitated behaviors (i.e., 0.66 for physical aggression, 0.26 for physical nonaggression, and 0.61 for verbal agitation) (Finkel et al., 1992). Quality of life was measured using the QUALID scale (Weiner et al., 2000). It was originally developed in the United States as an instrument to measure quality of life in late stage dementia. The instrument contains 11 items on a 5-answer option scale to be administered by professional caregivers or relatives who are familiar with the general behavior of the individuals with dementia. Higher scores (range = 11 to 59) indicate lower quality of life. It has been translated into Swedish and psychometrically tested, showing acceptable interrater reliability (0.69), high test–retest reliability (0.86), and satisfactory results concerning internal consistency (Cronbach’s alpha = 0.74 [Falk, Persson, & Wijk, 2007] and 0.77 [Falk, Wijk, & Persson, 2009]). The single-case stage was performed during a 12-week period. 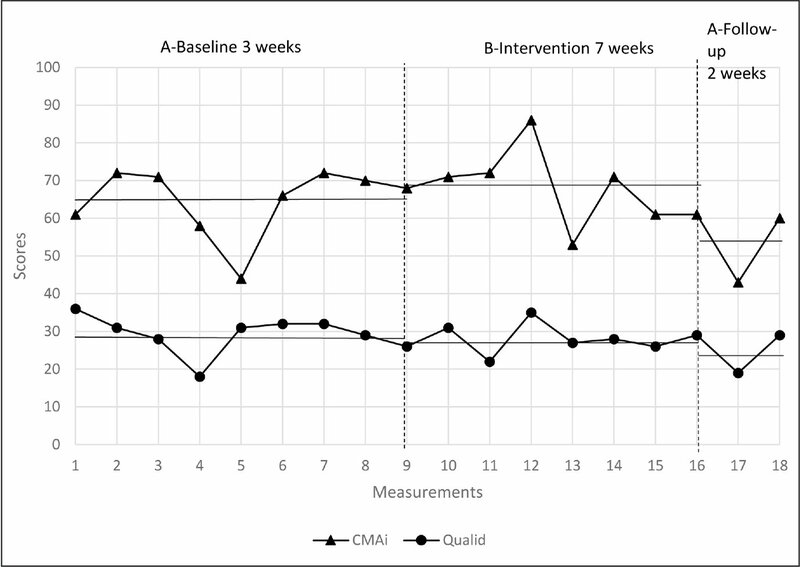 It started with a 3-week baseline (i.e., Phase A) followed by 7 weeks of intervention (i.e., Phase B) and was completed with a 2-week follow up without the intervention. Data were collected by the professional caregivers who were chiefly responsible for the participants. All data collection was supervised by the occupational therapist. The total sample from each participant included 18 measurements of QUALID and CMAI. Measurements were distributed over nine occasions; there were three measurements each week during the first 3 weeks in the Phase-A baseline. There were six occasions in Phase B, with three measurements in Weeks 7 and 10. Finally, there were three occasions of measurements in the Phase A follow up in Week 12 (Figure 1). In the interview stage, qualitative descriptions (Sandelowski, 2000) referring to naturalistic inquiry (Lincoln & Guba, 1985) were used to collect data concerning the professional caregivers’ and relatives’ perceptions of the robotic cat when used in the participants’ daily lives. Using qualitative descriptions offers a comprehensive summary of the studied event in everyday terms and a straightforward summary of the informational content of collected data organized in a way that best fits the data (Sandelowski, 2000). An interview guide was used to collect narratives relating to the (a) impact/meaning and use of the robotic cat in daily/working life and (b) its functionality. Interviews with the professional caregivers were conducted by a research assistant (C.S.) trained in the qualitative interview technique. Results from QUALID and CMAI were plotted for each participant for visual inspection (Kazdin, 1982). Visual analysis was based on variability of the data points across the various phases. To enhance the visual analysis, mean values of each phase (i.e., A-baseline, B-intervention, and A-follow up) were also included in Figures 3–6. Scores of agitated behavior (Cohen–Mansfield Agitation Inventory; CMAI) and quality of life (Quality of Life in Late-Stage Dementia scale; QUALID) for Case 1. The horizontal lines represent the phase mean values. Scores of agitated behavior (Cohen–Mansfield Agitation Inventory; CMAI) and quality of life (Quality of Life in Late-Stage Dementia scale; QUALID) for Case 4. The horizontal lines represent the phase mean values. Interviews were analyzed using a qualitative descriptive approach (Sandelowski, 2000). 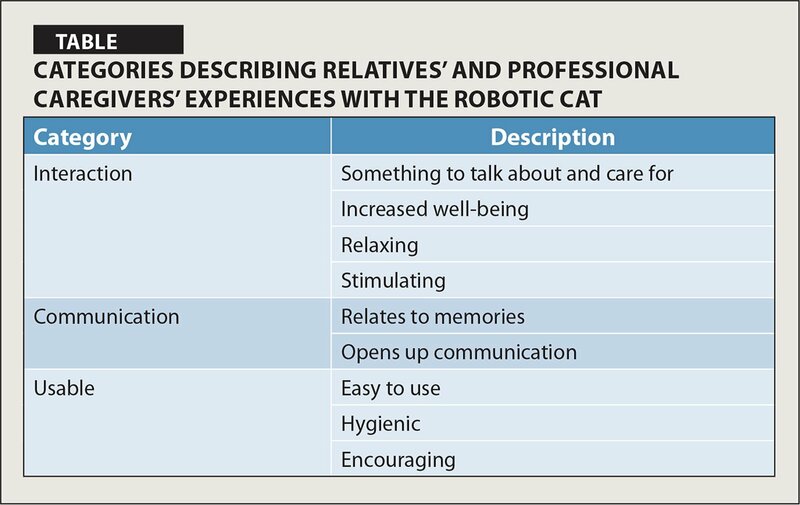 Qualitative description, in which patterns are formulated in categories, was used to present the variations in experiences of using a robotic cat in participants’ and their relatives’ daily lives and to account for professional caregivers’ experiences of using the robotic cat in their daily working life caring for individuals with dementia. In using alternative treatments and care for individuals with dementia, as represented in the current study by robotic pets, specific regard should be paid to the risk of ridicule or giving the individual with dementia the impression that the robotic pet is a living pet. This issue was discussed and the importance of the participants’ integrity was emphasized to all staff and relatives included in the current study. In approaching participants with JustoCat, it was presented as a robotic pet and not a live animal. JustoCat was introduced in private, focusing on the participant’s reaction and ensuring that no aversion was displayed. The Regional Ethical Board in Uppsala, Sweden (2012/098), approved the study and informed consent was obtained from all participants. In cases in which the participants were not able to understand and make decisions, the individual with power of attorney gave informed consent on their behalf. It was also assured that participants who enjoyed using the robotic cat could keep it after the study. Results are presented in two parts: single-case quantitative and qualitative interview stages. The four participating individuals with dementia were assessed for agitated behavior using the CMAI instrument; possible scores ranged from 29 to 103. To measure quality of life, the QUALID scale, with scores ranging from 11 to 55, was used to assess the four individuals with dementia before, during, and after intervention with the robotic cat. Low summary scores for each instrument indicate less agitated behavior and better quality of life. Case 1. The first individual with dementia had CMAI scores ranging from 50 to 83. The baseline shows a steady line (mean = 55.9). 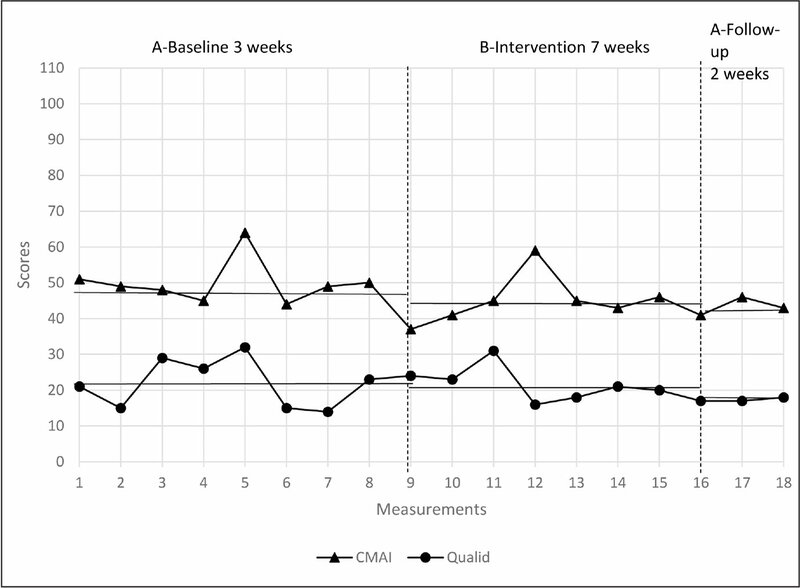 During the 7-week intervention, greater variation (mean = 62.0) was shown, as was the case in the follow-up period (mean = 69.7). The QUALID scale result showed less variability in scores (range = 17 to 24) throughout all phases, with mean values of 19.1 (A-baseline), 19.3 (B-intervention), and 19.0 (A-follow up) (Figure 3). Case 2. The second individual with dementia had CMAI scores ranging from 28 to 61. According to the visual inspection, variation in all three phases was apparent, with one peak of agitation in each phase. Overall CMAI scores were low, with mean values ranging between 34.5 and 40.7 (A-baseline: mean = 34.9; B-intervention: mean = 34.5; A-follow up: mean = 40.7). The QUALID scale result showed less variability in scores (range = 11 to 22) throughout all phases, with mean values of 15.3 (A-baseline), 13.8 (B-intervention), and 14.0 (A-follow up) (Figure 4). Scores of agitated behavior (Cohen–Mansfield Agitation Inventory; CMAI) and quality of life (Quality of Life in Late-Stage Dementia scale; QUALID) for Case 2. The horizontal lines represent the phase mean values. Case 3. The third individual with dementia had CMAI scores ranging from 43 to 86. The baseline shows a line with one dip of less agitated behavior, but is otherwise a steady line (mean = 64.7). 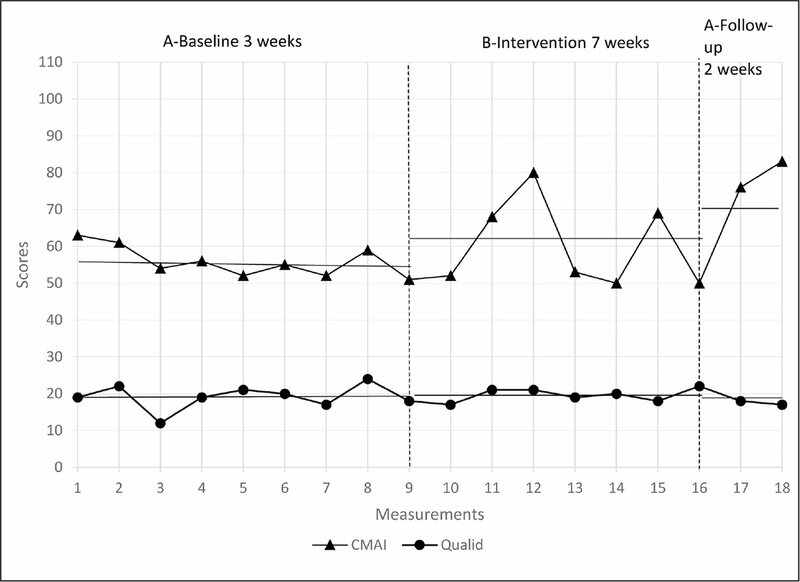 During the 7-week intervention, there was greater variation (mean = 69). The follow-up period was variable but with lower scores compared to the two other phases (mean = 54.7). The QUALID scale result also showed some variability in scores (range = 18 to 36) throughout all phases, with mean values of 29.1 (A-baseline), 28.2 (B-intervention), and 25.7 (A-follow up) (Figure 5). Scores of agitated behavior (Cohen–Mansfield Agitation Inventory; CMAI) and quality of life (Quality of Life in Late-Stage Dementia scale; QUALID) for Case 3. The horizontal lines represent the phase mean values. Case 4. The fourth individual with dementia had CMAI scores ranging from 37 to 64. The baseline and intervention lines show a peak in agitated behavior in what is otherwise a steady line (mean = 48.6 and 46.5, respectively), as was the case in the follow-up period (mean = 43.3 for both). The QUALID scale result showed varied scores (range = 14 to 31) throughout all phases, with mean values of 22.1 (A-baseline), 21.5 (B-intervention), and 17.3 (A-follow up) (Figure 6). The analysis resulted in three categories describing the impact, use, and qualities of the robotic cat: interaction, communication, and usability (Table). Increased Interaction—Impact/Implications of the Robotic Cat. The professional caregivers and relatives experienced the robotic cat as an opening to communication in caring for individuals with dementia in a late stage of the disease. JustoCat was the reason why one individual with dementia regained his/her speech. One participant’s son expressed: “…now we have something to talk about—the robot cat! Conversations about the weather and the meals are so meaningless; the robot cat has given us meaning in our communication.” Professional caregivers and relatives also experienced the robotic cat as “something else to think about,” something that could break the vicious circle of constant repetitive behavior. [The participant] began to talk about animals he had had and...that he had worked with and he said he liked being out in the forest looking at the animals and just sitting and enjoying nature. “I miss that a little bit,” he said…. He had not talked about it like that before; it was the first time that happened like that. JustoCat was considered to be a common interest, something to talk about and something to do. One of the professional caregivers referred to it, with reference to the first case, as moments “of waking up”; she explained that the participant had previously been very introverted, but when the intervention started, she perceived the participant to be more aware and awake. Communication—Using the Robotic Cat. JustoCat was used for interaction and as a communication tool. It provided a common topic of conversation. In one case, JustoCat was used as a complement to/replacement for sedative medication. In this situation, the professional caregiver offered JustoCat to the participant, who then placed the cat on her chest and became more relaxed. Participants would place JustoCat on their chest, lap, and arms, as well as on tables, chairs, beds, or their walkers. JustoCat could also be used in spontaneous group sessions in the day room with other participants, relatives, and professional caregivers. JustoCat stimulated participants to participate in other activities and increased their activity levels (e.g., demonstrating the cat to others). When the JustoCat was charging, they asked for it. However, some negative aspects also arose. One of the participants may have cared too much about the cat; it became a worry. During the intervention, the participant started to show a tendency to try and escape the dementia care unit. This behavior was interpreted by the professional caregiver as the robotic cat creating too much responsibility for the participant. Usable—Qualities of the Robotic Cat. Professional caregivers perceived JustoCat to be reliable, with a nice face, big eyes, and natural size and weight. Its response to stroking by purring was highly praised. They also appreciated that JustoCat had few and reliable functions. Another appreciated aspect was the possibility to comply with hygiene routines (i.e., the cat’s fur is washable and use is restricted to one individual). If another participant used the robotic cat, the fur had to be replaced. Professional caregivers also perceived JustoCat to be easy to use and that it encouraged care. The weakness of the current study is the small scale; it was only a pilot study based on a small amount of data from four individuals with dementia and their relatives and professional caregivers. It must be considered that the aim was, as an initial test, to explore participants’ reactions, as well as relatives’ and professional caregivers’ experiences with JustoCat in participants’ daily lives regarding usability, function, and effects. Another aim was to explore data collection methods and the measure of usability in developing the care or treatment of individuals with dementia using interactive robotic pets. If a single-case design is used to evaluate the implementation of new treatments, it is vital that measurements are taken frequently, ensuring a steady baseline during the implementation and follow-up phases (Kazdin, 1982). Being consistent and collecting data until a steady line is apparent is important. Although the current authors did not take enough measurements, they advocate the single-case design with its advantages of allowing within-case comparisons of an individual. Although the interview stage used numerous closed questions, which potentially limited the richness of data, it complemented the measurements. As shown by the first case, alternative and additional data collection is valuable for a correct interpretation of results (Polit & Tatano Beck, 2004). Considering the current study has the aforementioned weaknesses, another confounding factor must be mentioned—specifically, the extra attention participants obtained with the implementation of the robotic cat and possible bias related to the Hawthorne effect (Holden, 2000), which was not controlled. This bias may have influenced the results in a positive way. The results cannot be generalized but are credible if readers recognize descriptions or interpretations as comparable to their own experiences (Sandelowski, 1994). Accordingly, the results can be transferred to comparable situations and contexts. In the Western world, the majority of individuals with dementia spend the last part of their lives in nursing homes or dementia care homes. Some individuals with dementia could increase their well-being and quality of life with therapies, including music, singing, and massage, or by the company of pets. The current pilot study of four individuals with dementia and their relatives and professional caregivers showed interesting results. First, living with severe dementia is a situation with ups and downs concerning quality of life and agitated behavior, as presented in the single-case study design. Second, the analysis of the interviews shows the positive effects of the robotic cat providing stimulation, comfort, and peace to individuals living with dementia. Third, professional caregivers and relatives found the robotic cat to be a useful, reliable, and multifunctional tool in their relationships with the participants. 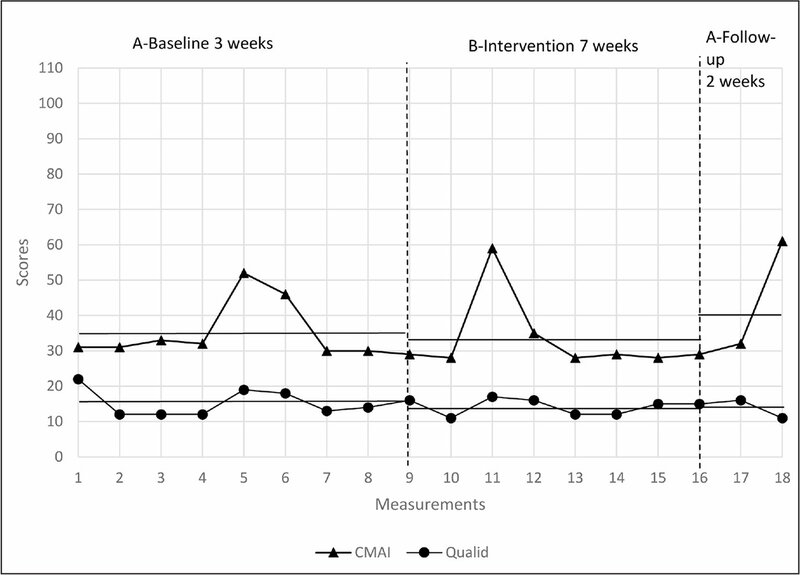 The outcome of the single-case design of measuring participants’ agitated behavior (i.e., with the CMAI) and quality of life (i.e., with the QUALID scale) showed variations between the A–B–A phases. Caution is needed in interpreting these results. The CMAI results showed no obvious trend, with differing results over phases or between cases. However, the first case was an exception; the participant became more agitated, with increased scores on the CMAI in the intervention and follow-up phases. Spontaneously, an increased BPSD should be interpreted as a negative effect; however, in this particular case, the professional caregiver found it to be a positive sign, interpreting the higher scores as awakening moments in an otherwise introverted life. The single-case design allows results to be interpreted based on each individual (Kazdin, 1982) and his/her specific situation, and it is important to bear in mind what the baseline entails and not be blinded by the instrument. The first case therefore stresses how important it is to collect data from various perspectives, especially if vulnerable individuals are involved in the study. In this case, the professional caregivers, who had specific knowledge of the first case, could provide important qualitative information supporting the interpretation of the outcome of the single-case design study. Considering the QUALID scale results, the mean values indicate decreased scores in the follow-up phase and thus a better quality of life for all cases. However, generally, the current findings show that three of the four cases had ups and downs in all phases, and it is obvious that too few measurements were taken to draw any certain conclusions from the results. Consequently, it is not possible to draw any conclusions as to whether the CMAI and QUALID instruments met requirements. However, considering the above-mentioned lack of measurements, this failure should not be attributed to the instruments. Interviews with professional caregivers and relatives describe results similar to other studies of robotic pets (Roger et al., 2012), suggesting that integration of social robots may be valuable for individuals with dementia with BPSD in long-term care settings. JustoCat was helpful in interactions with individuals with dementia as a vehicle for communication, often in the form of reminiscence (Woods et al., 2005). JustoCat provided an opportunity for emotional release, enabling the expression of positive emotions toward the robotic cat and engaging in humor and play, prompting dialogue between relatives and the participants, and providing a diversion from usual conversations. Undoubtedly, it is possible to associate the theory of social support (Beck & Katcher, 2003) to this aspect, but JustoCat functioned as a social support by itself and among the relatives, professional caregivers, and participants. JustoCat provided participants with comfort and stability, which may be explained by its relaxed breathing and considerable weight (approximately 3 kg). Previous studies have reported reduced stress with the use of robotic pets (Wada et al., 2004) and, although this factor was not measured in the current pilot study, the statements about comfort and using the robotic cat instead of sedative medication may indicate a reduction in stress. Moments of joy, reduced feelings of loneliness, and more opportunities for connecting with something outside oneself were also observed, which was also supported by previous studies (Libin & Cohen-Mansfield, 2004; Kanamori et al., 2002; Wada et al., 2004). Individuals with late-stage dementia living in dementia care homes need help with almost every aspect of everyday life. This condition does not give many opportunities to care for another living being, something which, relating to the biophilia theory (Wilson, 1984), might be seen as a human need. JustoCat may offer individuals with dementia an opportunity to care for something that reminds them of an animal and experience a positive reaction (e.g., the robotic cat purring after being stroked), which might contribute to meeting the need for a basic connection to other living species. A reason for introducing a robotic cat into the care of individuals with dementia is the increased need for alternative/complementary forms of care and innovative care solutions that meet the needs of this population. Previous studies also call for further exploration (Bernabei et al., 2013). Therefore, it must be appreciated that the prerequisite for introducing JustoCat as a form of treatment is to increase the well-being of individuals with dementia and not to lessen the workloads of professional caregivers (Sharkey & Sharkey, 2010). Although a decreased psychological workload may be a secondary effect, it is not the primary aim. 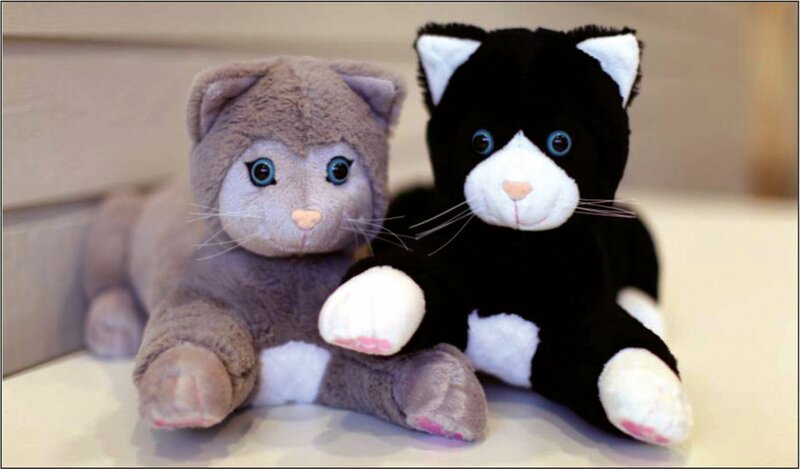 Libin and Cohen-Mansfield (2004) showed in individuals with age-related cognitive decline and Alzheimer’s disease that those with higher cognitive function were more interested in a robotic cat compared to a soft toy cat. This interest may be an indication to introduce JustoCat in earlier stages of dementia, although the current study focused on individuals with dementia at a late stage. In an overview of the use of social-assistive robots, Huschilt and Clune (2012) concluded that individuals with dementia deserve the chance to have access to technology that could improve their quality of life. A robotic pet is not of value for all individuals with dementia, but may be for some. Professional caregivers in dementia care need various tools that improve the quality of life for individuals with dementia, and one of these tools could be a robotic cat. Creswell, J. (2010). Mapping the developing landscape of mixed methods research. In Tashakkori, A. & Teddlie, C. (Eds. ), Sage handbook of mixed methods in social & behavioral research. Newbury Park, CA: Sage. Kazdin, E.A. (1982). Single-case research design. Oxford, UK: Oxford University Press. Polit, D. & Tatano Beck, C. (2004). Nursing research: Principles and methods (7th ed.). Philadelphia, PA: Lippincott Williams & Wilkins. Weiner, M.F., Martin-Cook, K., Svetlik, D.A., Saine, K., Foster, B. & Fontaine, C.S. (2000). The quality of life in late-stage dementia (QUALID) scale. Journal of the American Medical Directors Association, 1, 114–116. Wilson, E.O. (1984). Biophilia. Cambridge, MA: Harvard University Press. Gustafsson, C., Svanberg, C. & Müllersdorf, M. (2015). Using a Robotic Cat in Dementia Care: A Pilot Study. Journal of Gerontological Nursing, 41(10), 46–56. There is an increased need for alternative/complementary forms of care to meet the growing number of individuals with dementia. For some individuals with dementia, an interactive robot (e.g., a robotic cat) can increase well-being and quality of life. The current pilot study explores the reactions of individuals with dementia using an interactive robotic cat and their relatives’ and professional caregivers’ experiences. An interactive robotic cat can be a tool for improved interaction and communication in dementia care. Dr. Gustafsson is Senior Lecturer, Ms. Svanberg is Lecturer, and Dr. Müllersdorf is Associate Professor, School of Health, Care, and Social Welfare, Mälardalen University, Eskilstuna and Västerås, Sweden. The authors have disclosed no potential conflicts of interest, financial or otherwise. The study was supported by the Social Contract (Samhällskontraktet) and Robotdalen. The authors thank the study participants and staff at Attendo Care Eskilshem, and the School of Health, Care, and Social Welfare, Mälardalen University, Sweden, for support during the process of the study. Address correspondence to Christine Gustafsson, PhD, MSc, RNT, Senior Lecturer, Mälardalen University, Box 325, SE-631 05 Eskilstuna, Sweden; e-mail: christine.gustafsson@mdh.se.